If the moderator happens to be online while hosting a conference call, it's easy to use the included free Live Conference Viewer and gain added control of the conference call. Web access is not necessary (just a phone) to use the Unlimited Conference Call plan and receive the great economic benefits of being able to host 'unlimited' conference calls throughout the month for one flat fee. Online access is necessary if the leader wants to utilize the included Live Conference Viewer. There is no software to download. Login is as easy as clicking a link and entering a username and passcode. A special Web address and passcode is sent to you upon account activation to use the Live Conference Viewer included free with your account. Live Conference Viewer - What does is show ? It enables the leader or moderator to view the conference call as it happens. All of the participant's data is displayed on the leader's monitor. See example screen capture below. As you can see, the Caller ID and connect time are viewable. This data appears as the participants login, in real time. 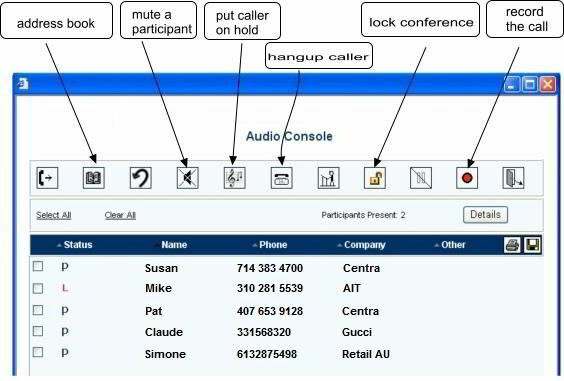 Many customers regard this free feature as a valuable tool for their conference calls. How do you get the Free Live Conference Viewer ? Upon account activation, we'll send you a special link to login. If you have a web enabled computer, start using the Live Conference Viewer on your next conference call. All participants are displayed on the hosts monitor upon login. Learn which caller is currently making the most noise. This is useful when you need to diagnose noise coming from an individual line. Mute any line with one click. Entry and exit chimes can be enabled during the introduction and then disabled prior to recording a conference. Q & A Mode (Host can speak but Conferees are mute. (Only the Host can be heard, all participants and any background noise is muted). This locks out any new participants from joining the call. Begin to permit new callers to enter the conference call by clicking the 'Lock Conference' icon again. See the list of participants with their Caller ID and view the total participant count. Begin recording the conference call. Create an ID number for easy reference and later download. Delete any participant, if needed, with one click.